The Foundation for Accountability and Civic Trust is asking the Department of Justice to investigate three outside political groups threatening Sen. Susan Collins (R-ME) to vote against Supreme Court nominee Brett Kavanaugh or else. The Maine People’s Alliance, the Mainers for Accountable Leadership PAC and Be a Hero Fund PAC are "illegally running a crowdfunding website meant to bribe" Collins over her Kavanaugh vote. The website asks donors to contribute to Collins's potential opponent in her next campaign if she votes to confirm the nominee. In an emotionally charged video, the Mainers for Accountable Leadership PAC said that a "yes" vote on Kavanaugh would reverse Roe v. Wade, set women back years and "kill" others. They ask supporters to pledge money to her opponent. FACT notes that bribing a public official is illegal under 18 U.S.C. section 201(b)(1). “The three groups have made the illegal promise to give over one million dollars to another person with the stated intent and purpose to influence a Senator’s vote,” FACT's complaint reads. 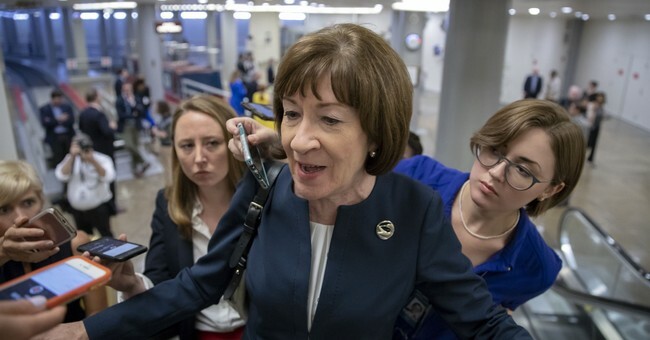 Collins also spoke out against the Maine groups' threats, telling Newsmax that she considers the groups' campaign "quid pro quo fundraising to be the equivalent of an attempt to bribe me to vote against Judge Kavanaugh." But, they fired back and told her she was confusing bribery with free speech. If that’s so, it’s not just Kavanaugh’s critics who might be in legal trouble. Every billionaire who has dumped millions into a super PAC that buys issue ads calling on individual members of Congress to vote a certain way would stand on the same shaky ground. But it’s only the citizens group, not the billionaires, that is accused of breaking the law. As Guy noted, other leftist activists are wishing violence or sexual assault on the senator and her staff.